PHUKET: Triathlon legend Chris McCormack of Australia shrugged off the disappointment of his Laguna Phuket Triathlon (LPT) debut last weekend with a gritty performance to win the final Ironman 70.3 Laguna Phuket. Pro podium finishers (left to right: Ruedi Wild; Radka Vodickova; Chris McCormack; Melissa Hauschildt; Alberto Cassadei; and Belinda Granger. 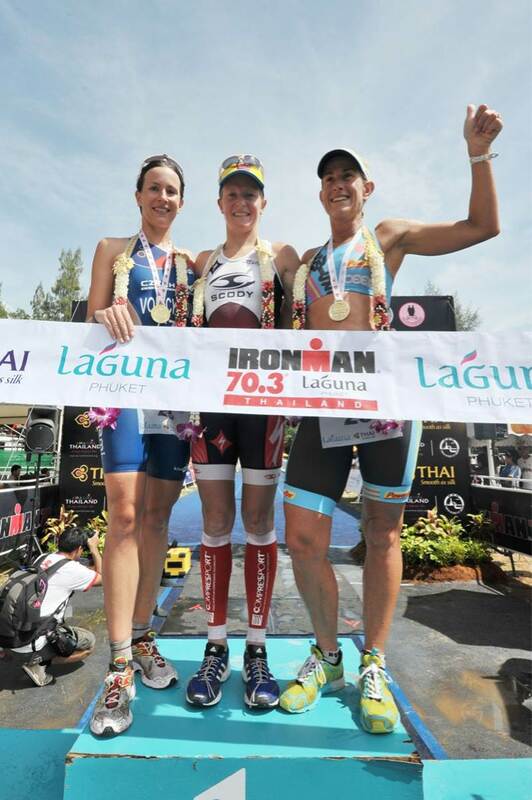 Women’s Champion Melissa Hauschildt (centre) wth second placed Radka Vodickova (left) and Belinda Granger. It was a transformed “Macca” who held off the challenge of last weekend’s winner Ruedi Wild of Switzerland – almost 10 years his junior – to complete the 1.9km swim, 90.1km bike ride and 21.1km run in 04:04:40. In a morning of topsy-turvy weather in Phuket, the 39 year-old two-time Ironman World Champion stormed out of T1 onto the bike course and was then among a charging breakaway pack with Wild, American Chris Lieto, Alberto Cassadei of Italy and impressive young German age grouper Tim Meyer out of T2 into the run. McCormack and Wild pulled away and only 18 seconds separated them at the halfway mark of the two-lap run, but the Australian stepped up a gear to stretch his lead and cross the finish line almost three minutes ahead of Wild, who followed in 04:07:17. Cassadei, third in last weekend’s LPT when McCormack could only manage eighth place, again took the third men’s pro podium spot in 04:08:06 with Meyer third overall in 04:07:32 and winner of his 18-24 age group. “I was more focused and better prepared for this race,” said McCormack, who changed his bike’s gear set this week after experiencing Phuket’s legendary hills for the first time in LPT. “With the conditions today it wasn’t about speed, but I played smart and it feels really great to win here, a place I’ve heard so much about and always wanted to race,” he said. In a women’s field opened up by the last-minute withdrawal due to illness of double Ironman and Ironman 70.3 World Champion Leanda Cave of Great Britain, Melissa Hauschildt made it a one-two for Australia with a solid defence of her 2011 title. Hauschildt fought back against a plucky performance from last weekend’s LPT Champion Radka Vodickova of the Czech Republic, who led out of T1 into the bike course as she aimed for two Laguna Phuket victories in a row. But Hauschildt – whose bike and baggage were delayed by her airline and only arrived in Phuket on Saturday morning – overhauled her at the 40km mark and was almost seven minutes ahead of the Czech Olympian coming out of T2 into the run. She finished in 04:23:30, with Vodickova second in 04:31:46 and Laguna Phuket veteran Belinda Granger of Australia third in 04:41:53. “Radka managed to get a good lead on me but I passed her at the top of the first steep hill and I was pretty stoked by that,” said Hauschildt.